Athletes place the the anterior cruciate ligament of the knee under a tremendous amount of stress. If left untreated, ACL injuries can lead to cartilage damage. ACL injuries are far more common in young women athletes than in men, but we don’t know why this is so. ACL surgery involves the reconstruction of the ligament. While numerous ACL surgery techniques exist, your orthopedic doctor will recommend the best approach based on your injuries and condition – to return you the full range of motion and stability to the knee. Premier Orthopedic Specialists Of Tulsa has treated countless cases of ACL injuries. Post-surgery, our rehabilitation specialists and athletic trainers will take you through a comprehensive rehabilitation plan for your quick and healthy recovery. Premier Orthopedic Specialists Of Tulsa doctors will examine you, conduct physical tests and take X-rays to determine the extent of damage to your ACL. Nonsurgical options may be all that’s needed, if the knee cartilage is undamaged, the knee proves to be stable during typical daily activities, and if the person never again wishes to participate in high-risk activities such a pivoting, or jumping. Doctors recommending the nonsurgical option may specify physical therapy, the wearing of a knee brace, or adapting some typical activities. Physical therapy may be recommended to strengthen muscles around the knee – in order to to compensate for the absence of a healthy ACL. Physical therapy will focus on strengthening muscles such as the hamstring, quadriceps, calf, hip, and ankle. This therapy will help to re-establish a full range of motion of the knee. People applying nonsurgical options can expect to be back to normal daily activity within one month. Your orthopedic doctor may recommend reconstructive surgery if the knee gives way during typical daily activities, shows functional instability, or if the person continues to enjoy high-risk activities. Reconstructive surgery may also be recommended if there is damage to the meniscus (cartilage). This surgery is completed using arthroscopic techniques. There is also an option for an autograft to be done using a chosen tendon. You will want to weigh the pros and cons of surgical treatment. Consider possible complications and talk with your surgeon before proceeding with this form of treatment. Premier Orthopedic Specialists Of Tulsa orthopedic doctor replaces the damaged ACL with strong, healthy tissue taken from another area near your knee. You might utilize a strip of tendon from under your kneecap (patellar tendon) or your hamstring. Your surgeon threads the tissue through the inside of your knee joint and secures the ends to your thighbone and shinbone. 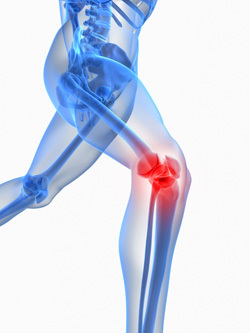 In a few cases when the ACL is torn cleanly from the bone, it can be repaired. Less active people may be treated non-invasively with a program of muscle strengthening rather than knee surgery. The ACL is the most commonly injured knee ligament. It tears during sudden dislocation, torsion, or hyperextension of the knee. Swelling attributed to bleeding from the tear may cause pressure and some discomfort, but the torn ligament itself rarely causes much pain. Due to the lack of severe pain most patients are able to postpone surgery based on the extent of the damage to other tissues in the knee. It is a very common injury in football, hockey, skiing, skating, soccer (and other field sports) and in most cases basketball, due to the enormous amount of pressure, weight, and torque the knee must withstand. Usually the injury occurs when someone tries to rapidly change direction with the leading leg out, twisting the knee; this is usually followed by a loud popping sound. The injury may also occur under sudden high pressure contact, especially side on. Generally if the knee is locked, and the leg is firmly planted, then there is a much greater risk of injury. Environmental. Sports which include running, jumping, and landing pose the most potential for injury to the athlete. Interestingly, the risk for rupture of the anterior cruciate ligament does not increase in contact sports (as opposed to noncontact sports). About 70 percent of ACL tears are noncontact injuries. Anatomical. ACL injuries are especially common in female athletes, due to many possible contributing factors. The most prevalent explanation proposes that female athletes tend to land more straight-legged than men, removing the quadriceps’ muscles shock-absorbing action on the knee. Often the knee on a straight leg can’t withstand this and bends sideways. Hormonal. High levels of hormones including estrogen have been associated with an increased risk of ACL rupture.